Apologies for a double-post to iDevBlogADay, but I didn’t want to hit the wider audience with two straight anime/manga-related iOS blogs, and I was way behind on entries for the first few months of the year anyways. This is a high-pressure switch for Apple. 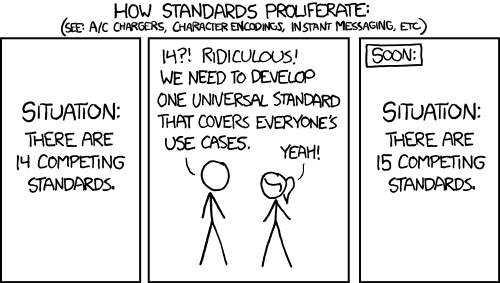 Regressions will not be acceptable. The purported whiz-bang 3D view stuff might be great, but users are going to have pitchforks and torches in hand if practical stuff like driving and walking directions are less accurate than they were with Google’s data. Keep in mind too, that Android phones ship with turn-by-turn navigation. This was an interesting graf to me, because Gruber usually gets the details right, and this time he’s pretty far off. Start with “users are going to have pitchforks and torches in hand if practical stuff like driving and walking directions are less accurate than they were with Google’s data.” That’s a fundamental misunderstanding of what the iOS SDK provides. Neither Map Kit, nor any other part of the SDK, provides directions. Map Kit only provides map tile images, and a “reverse geocoder” that may be able to correlate a given location to a street address or at least a political region (city, state/province, country). There’s nothing in Map Kit that knows that a yellow line is a road, a blue polygon is a lake, a dashed line is a state or country border, etc. More details in my write-up of writing Road Tip and my Bringing Your Own Maps talk from 2010, but the long-and-short is that any app that provides directions has to be getting its data from some source other than Map Kit, probably a web service hosted by Google, MapQuest, Bing, etc. I also did a little research to see what the Android API for this stuff looks like, assuming it was easier, and was quite surprised to see that it’s not. A DrivingDirections class was apparently removed after Android 1.0, presumably due to the fact that implementing it required third-party data (TeleAtlas, NAVTEQ) that Google wasn’t in a position to redistribute for free. The suggested workarounds I’ve seen are all to either license a third-party directions API (embedded or webservice), or to make a specific request to maps.google.com and scrape the result as JSON… in other words, to use Google as the directions webservice and not worry about the terms of service. I only spent about 15 minutes looking, but it didn’t appear to me that getting directions is any easier for Android developers than it is on iOS. So while Gruber notes that “Android phones ship with turn-by-turn navigation”, that seems to be a user feature, not a developer feature. So, on the one hand, third-party apps probably won’t change right away, because they haven’t counted on iOS for their directions anyways. But maybe that’s an opportunity: if Apple controls its own data, maybe it could offer an easy-to-use directions API, consisting of easy Objective-C calls rather than JSON or XML parsing like webservice clients have to do now. There might be a licensing snag too: using Map Kit today means that developers are implicitly accepting the Google Maps terms of service. If iOS 6 switches providers, the terms presumably change as well, and I wonder how that would be handled. Would creating a MKMapView magically default to the new Apple maps in iOS 6 (and thereby inherit new Apple terms of service), or would developers maybe have to resubmit or add a credential to their apps to get the new maps? And taking maps in-house has other interesting side-effects. The other day when I was out with my kids, I searched for “Arby’s” in Jackson, MI and the result appeared on the map as a “Sponsored Link” (I can’t re-create it here at home… maybe it’s only an ad when you’re physically nearby?). The money for that ad presumably goes to Google, a revenue stream that will start to dry up if Apple provides its own business location data when searching maps. We’ve also heard that Siri could hurt Google search if people start performing speech-based searches rather than keying terms into google.com via the mobile browser. And isn’t this exactly what Google was afraid of, and why they felt the need to create Android? With iOS, Apple is in a position to disintermediate Google. And with Apple’s wrath towards Android, the company may be more interested and willing to do so than it might otherwise have been. Smooth move, Andy. Along with loading up on collectibles (Angel Beats! Anohana!) and finding new shows to watch (Toradora! ), I had a few encounters that, surprisingly, led to some insights about where digital media is and is going on the platforms I work with. In the Sentai Filmworks panel, I noticed a guy in the front row shooting video with his iPad. Not a bad idea — the battery life is enormous, so you might only be limited by using up the flash storage. But what I discovered later was that he was the animecon-industry channel on UStream, and was streaming all these panels live on the internet. From the iPad. Multiply this by a bunch more iPads and a bunch more interesting pursuits and I start to wonder why I’m not already combing UStream for cool stuff streaming now. BTW, I asked three questions in the Sentai Panel. Watch the recorded version and you can hear me asking about whether iTunes download-to-own makes still sense for them, why they went back and licensed the older ef: A Tale of _____ shows, and what led to the reissue of Clannad After Story with an English dub. Another panel I went to was a how-to showing how Yamaha’s “Vocaloid” software can be used to create synthetic singers, such as the very popular (and much-cosplayed) Hatsune Miku. What I didn’t expect to find out is that the Yamaha guy who created the Vocaloid software is a big Mac fan, and despite the fact that the Vocaloid products are Windows-only, was shown in a video from last year’s Anime Expo toting a MacBook Air to a panel (it may be this one, but if not, it still shows Ito-san clearly using an Air). Duly inspired by this, the panelists at ACen showed a MacBook-based workflow that used Vocaloid 3, despite the fact the program is Windows-only, and was only partially localized for English. They played a synth into Logic Pro to lay down a base music track, then played a second track as the vocal line. They exported that track as a .mid (MIDI sequence) in a directory shared with VMWare, where it could then be imported into Vocaloid and sung by Miku. After tweaking the Japanese phonetic lyrics, they exported a .wav back to Logic to complete the song. Of course, wouldn’t it be nicer to cut Windows out entirely? Knowing that there are Mac fans at Yamaha and Crypton, maybe Apple should make some calls. 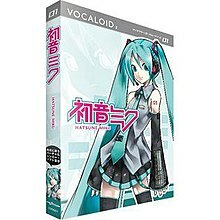 Having Hatsune Miku as an instrument in GarageBand or Logic would be a hell of a lot of fun, and would surely lead to getting her as the vocalist of even more songs on iTunes (she already had more than 1,500 last time I checked). I’ve also mentioned on several occasions that the AUSampler audio unit in Lion and iOS 5 is doing a pitch shift more or less equivalent to what Vocaloid does, with the key difference that AUSampler can be played live, while Vocaloid uses a render step and could look ahead to upcoming notes to produce more realistic output. I’ve meant to try hacking up a “Hatsune Mac-ku” with AUSampler one of these days… it’s on the list of experimental projects that could turn into an article/blog/session if I find the time to get it working. One of the first things I did on the show floor was to finally sign up as a paying subscriber for Crunchyroll, the streaming service that offers many anime shows within hours of their Japanese airdate. Considering I’m currently using it to keep up with Kids on the Slope, Bodacious Space Pirates, and Puella Magi Madoka Magica, I’ve come to feel like quite the freeloader. Part of the reason I’m watching so much Crunchyroll is that it’s easy to do so on the iPad while waiting in the hallway for my kids to fall asleep. Like a lot of Flash-based websites, Crunchyroll has had the sense to build an iPad app. And one of the upsides of having a real app is that the video can be sent over to an Apple TV for proper wide-screen viewing. When I look at the “Anime” folder on my iPad — consisting of Crunchyroll, Anime Network, Funimation Free, and Adult Swim — and then look at the icons on the Apple TV screen, I can’t help but wish that these streaming apps could be on the Apple TV itself. With the latest Apple TV update presenting us with a grid of app-like icons for the various services and providers, it sure feels like this is what we’re heading towards. And when you can just subscribe to your favorite sports league as an app and not deal with cable/satellite/local-broadcast hassles and blackouts, it starts to show the promise the cord-cutters have been talking about all this time. The New York Times had an interesting article on this the other day. After presenting the channel-as-app metaphor, they point out that this could bring about the “a la carte” model that so many viewers have wanted for so long: the ability to just buy the content that you want, and not have to buy a bunch of programming you don’t want. But they also identify the catch that I’ve worried about for years: many of the content providers are vertically integrated with distributors. All the NBC/Universal networks are owned by Kabletown Comcast, which means that they may not want to sell content directly to end-users when that cuts into the parent’s core business of selling cable subscriptions. In fact, when I saw the much linked Oatmeal cartoon about I Tried to Watch “Game of Thrones” and This Is What Happened, I had a specific thought when I got to the frame where the protagonist is flashing his credit card in front of the computer, saying he was ready to buy if only they would sell it to him. Here’s my thinking: HBO knows full well that there are people who subscribe to the channel entirely for the sake of one show. That is their business model: you buy it for Game of Thrones or The Sopranos, and as a bonus, you get to see Splash and Independence Day 400 times a month. Which is total crap of course, since we only care about Game of Thrones. So if you’re paying just for that show, what’s the cost? Say it’s $30/month times however long a season runs, plus time to unsubscribe, leaving a little room for customers who don’t bother unsubscribing religiously. Shall we say four months? Then that means a season of Game of Thrones is arguably worth $120 per subscriber. Now imagine if HBO put out a Blu-Ray set, day and date with the series, at that price point. Everyone would scream bloody murder. But, Mr. Oatmeal, you were flashing your credit card! Did you think that a new production should cost the same as a back-catalog show from 20 years ago that has already paid its bills several times over? But I’m kind of digressing into old arguments. The point to make about networks-as-apps is that Apple’s treating Apple TV as a “hobby”, the lack of an SDK for Apple TV, the company’s slow movement towards backing it up with content other than the not-terribly-popular iTunes download-to-own and partners like Netflix… it could be that they’re not going to take on the entire cable/satellite industry until they’re confident there’s a real opportunity, if not an absolute certainty, that they’ll win. What I see is a long game, where they roll out technologies like HTTP Live Streaming and AirPlay, see if they take, and let the pieces quietly get into place. Not a fiendish master plan… just preparing relevant technologies and partnerships so they can enter this war at a time and place of their choosing. Speaking of HTTP Live Streaming, one last point is to acknowledge what a tremendous success story this has been? Non-existent 5 years ago, it is now the technology that delivers all streaming video on the hundreds of millions of iOS devices, in a way that satisfies the security demands of the major media companies, sports leagues, etc. As I mentioned before, my iPad is full of video streaming apps, not just the various networks and content providers, but stuff like UStream that captures and streams live video. And speaking of HTTP Live Streaming, I’m preparing an all-new session on HLS for CocoaConf outside DC in late June. The early-bird deadline has been extended until this Friday (May 4), so if you want to see how cool this stuff is, you’ve still got time to save a few bucks. Now if you’ll excuse me, I need to put this Crunchyroll subscription to work and catch up on the subscriber-only new episodes, now that I just finished Angel Beats! from iTunes last night. It’s great that Xcode 4.3 packs all the SDKs and essential helper apps into its own app bundle, which makes Mac App Store distribution more practical and elegant, and brings Apple into compliance with its own rules for MAS distribution. Adapting Xcode into this form is also a prerequisite for eventually delivering an iPad version, which I continue to believe is one of those things that may be impossible in the near-term and inevitable in the long-term. However, this radical realignment means Xcode 4.3 has surely broken something in every Mac and iOS programming book. Lucky for me that mine are still in the works, though very close to being done. I updated the “Getting Started” material in iOS SDK Development this week to handle the changed install process, which along with the new chapter on testing and debugging should be going out to beta readers Real Soon Now. So this is the wrong time to be making changes, since we can only fix typos or (maybe) add footnotes. And that’s a problem because while Xcode 4.3 includes Core Audio itself in the OS X and iOS SDKs, it doesn’t include the extras anymore. And that breaks some of our examples. This doesn’t hit us until chapter 8, where we create an audio pass-through app for OS X. This requires using the CARingBuffer, a C++ class that was already a problem because many versions of Xcode ship a broken version that needs to be replaced with an optional download. CARingBuffer lives as part of Core Audio’s “Public Utility” classes in /Developer/Extras/CoreAudio/PublicUtility. So there’s our CoreAudio/PublicUtility folder, along with the AULab and HALLab applications that used to live at /Developer/Applications/Audio. We use AULab in chapter 12 to create an AUSampler preset that we can play with MIDI, but apps can live anywhere, so this isn’t a real big problem. Leave the path as-is and move PublicUtility into the Xcode app bundle. Kind of nifty, but I have zero confidence that the MAS’ new incremental upgrade process won’t clobber it. And an old-fashioned download of the full Xcode.app surely would. Re-create the old /Developer directory and put PublicUtility at its previous path. This requires changing the project to use an absolute path instead of an SDK-relative one, but /Developer is a reasonable choice for a path on other people’s machines. It suited Apple all these years after all. Forget installing PublicUtility at a consistent location and just add the needed classes to the project itself. Probably the least fragile choice in terms of builds, but means that readers might miss out on future updates to the Audio Tools download. In the end, I chose option #2, in part because it also works for those happy souls who have not had to upgrade to Lion and thus are still on Xcode 4.2, still with a /Developer directory. There is, however, a danger that future Xcode updates will see this as a legacy directory that should be deleted, so maybe this isn’t the right answer. A thread on coreaudio-api on where to put PublicUtility hasn’t garnered any followups, so we could be a long way from consensus or best practices on where to put this folder. For now, that’s how I’m going to handle the problem in the book’s downloadable code. This afternoon, I ran every project on Xcode 4.3, changed the paths to CARingBuffer in the one example where it’s used, and bundled it all up in a new sample code zip, learning-core-audio-xcode4-projects-feb-26-2012.zip. That will probably be the version we put up on the book’s official page once Pearson is ready for us. Now I just have to figure out how to address this mess in a footnote or other change that doesn’t alter the layout too badly. There’s nothing like losing your editor — to Apple, no less — to ratchet up the heat to finish a book that has been too long on the burner. But with Chuck doing exactly that at the end of December, Kevin and I had the motivation to push aside our clients and other commitments long enough to finally finish the Learning Core Audio book (yes, the title is new), and send it off to the production process. In our final push, we went through the tech review comments and reported errata — Lion broke a lot of our example code — and ended up rewriting every example in the book as Xcode 4 projects, moving the base SDK to Snow Leopard, which allowed us to ditch all the old Component Manager dependencies. For the iOS chapter, we rev’ed up to iOS 4 as a baseline and tested against iOS 5. One of the advantages of Xcode 4 is that the source directory is cleaner for source control (no more ever-changing build folder that you have to avoid committing), while also offering a pretty simple way to get to the “derived data” folder with the build result, which was important for us because we have a number of command-line examples that create audio files relative to the executable, and Xcode 4 makes them easy to find. In our final push, we also managed to get in an exercise with the AUSampler, the MIDI instrument that pitch-shifts the audio file of your choice, into the wrap-up chapter. So that should keep things nice and fresh. Thanks to Apple for finally providing public guidance on how to get the .aupreset file to load into the audio unit, and how the unit deals with absolute paths to the sample audio in the app bundle case. From here, Pearson will take a few months to layout the book, run it by us for proofing and fixes, and send it off to the printer. So… paper copies probably sometime in Spring. The whole book — minus this last round of corrections — is already on Safari Books Online, and will be updated as it goes through Pearson’s production process. It seems like there’s been a big uptake in Core Audio in the last year or two. More importantly, we’ve moved from people struggling through the basics of Audio Queues for simple file playback (back in iPhone OS 2.0 when Core Audio was the only game in town for media) and now we see a lot of questions about pushing into interesting uses of mixing, effects, digital signal processing, etc. Enough people have gotten sufficiently unblocked that there’s neat stuff going on in this area, and we’re fortunate to be part of it.